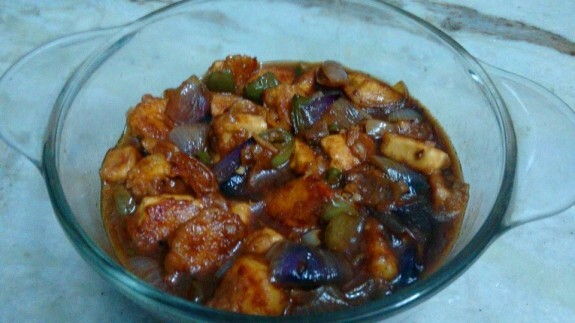 I am a huge fan of Paneer and I must say that Chilli Paneer is one of my favourite Chinese side dish. I mainly prepare this food with diced capsicum and onions rather than using spring onions because of not having in my kitchen. But it is suggested that spring onions make this dish as proper Chinese dish and give you the ultimate taste of Chilli Paneer. 1. Take a large bowl and add corn flour, black pepper powder, garlic chopped tomato sauce and soya sauce and mix everything well. 2. Add little water to make a thick paste of all. 3. Now add paneer cubes on this and marinate it and keep it aside for at least half an hour. 4. Heat oil in a pan and shallow fry the paneer cubes. 5. Keep the paneer aside. 1. Heat sesame oil in a pan and lightly fry the diced onions and capsicums. Keep it aside. 2. Now add the ginger garlic paste or chopped ginger garlic in the oil and stir fry it till the raw smell disappears. 3. Now, add the green chillies, black pepper, schezuan pepper and lightly stir it. Pour the veg stock or warm water and stir. 4. Now add red chilli powder, tomato sauce, soya sauce, sugar and salt. Mix everything well and simmer. 5. Add corn flour paste and stir well. Let it cook for 1-2 minutes to make the sauce thicken. 6. Now add the fried paneer cubes and simmer for 1-2 minutes. 7. Garnish with spring onions and serve it hot.